Yesterday I took Katie on a whirlwind surprise day going across Orlando to do new and exciting things; culminating in our surprise wedding proposal (complete with Magic trick) and her saying YES! So now, allow me to share the story with you. It began over two months ago as I decided that I was indeed going to join my life with Katie’s, and so began the plan. Because dear friends, if you know me, you know that I wouldn’t settle for anything less than awesome. Also with this plan I knew secrecy was of the utmost importance. Katie, like most women, has a sixth sense combined with eyes in the back of her head and a wicked ability to guess when and with what I’m going to surprise her. I tend to default to the unplanned improv it strategy but if I have to plan something, I’ll plan it, overplan it, re-plan it, and map the possibilities for success and failure. My first plan was chock full of awesome, but was also riddled with holes where things could go wrong and ruin the whole affair. I’ll spare you all the details but let me just say that it required five other people, all musicians, to be involved with it. And after some consideration I gave up on that idea and turned to another equally awesome but less risky possibility. Three weeks ago I told her to block yesterday off her calendar. It was going to be a surprise day. First step to awesomeness: do the unexpected. I kept her guessing by dropping false hints as we approached the day. Katie is very skilled at guessing what I have planned, and so I had to be extremely careful around her. I almost had to get Snape to teach me legilimancy just so I could protect this secret from her. 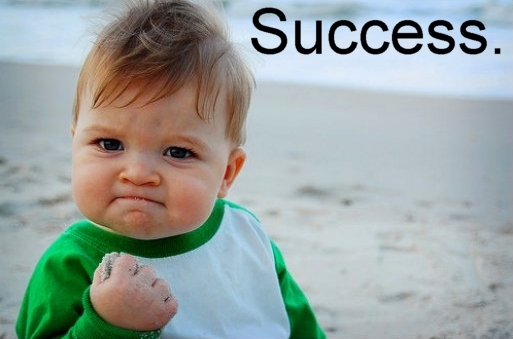 Then this morning when she woke up, the day began and I was all set for awesomeness. First we headed out to breakfast at Christo’s on Edgewater. A great little restaurant that came very highly recommended. We enjoyed a nice meal and then went off to Leu Gardens. 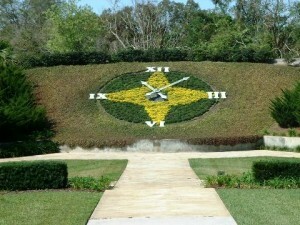 Leu Gardens is a botanical garden here in Orlando, spread over 50 acres it has beautiful plants and lots of trees. Since Katie hadn’t gone before and I hadn’t been there in over a decade, we enjoyed it a great deal. Unfortunately though it was quite hot. We decided not to see the whole property but we enjoyed what we did see. As we were leaving Leu Gardens we discovered that the Enzian Theater had a matinee of Indiana Jones and the Temple of Doom. Katie and I love to visit the Enzian theater for a movie. They have a great theater and their food is excellent, and when we go it’s always for a top-notch movie. 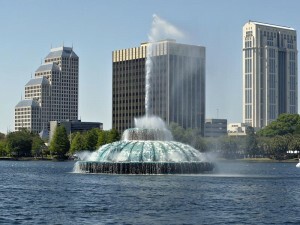 We enjoyed the movie and after leaving we headed to the Orlando Science Center. Now normally this wouldn’t excite most people but I had two aces in my sleeve. First, they had an exhibit about Mr. Potato Head, which Katie collects. Then second was that Katie had not been to the Science Center since it moved to its new location which was probably fifteen years ago. Two recipes that nearly guarantee a win. Thankful that I had those two aces, because the Science Center was a bit of a let down. It was without AC (which had apparently been that way for two months) and the Potato Head Exhibit was for three year olds and nothing for the adults. But we enjoyed ourselves none-the-less. We played with the exhibits and then left, heading home for a brief intermission. We walked Mattie, cleaned up after sweating some in the heat, and then headed back out. Then we decided to grab an early-ish dinner at Bento which is a great sushi pan-asian restaurant on Orange ave.
Katie was in total shock. She couldn’t quite process it. Mission accomplished, I had completely blindsided her. “Yes. Of course!” I smiled and kissed her, then pulled back and said, “Now, for the sake of completeness…” Yes I actually said this. 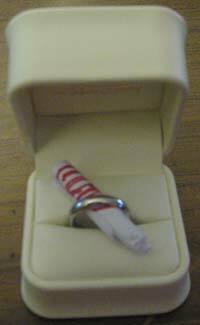 “There’s a piece of paper rolled up inside the ring in the box, pull it out and see what it says. “Q [poorly drawn heart]” – Her brain is fried it’s short-circuiting everywhere. She didn’t understand what it meant. “Your card, it was the Queen of Hearts.” I explained helpfully. And yes, it was her card. Now she was completely blown away. Her world was rocked. She was astounded. It was my crowning achievement. My Muhammed Ali one-two punch for the world championship. My perfectly executed play as the clock winded down to hit the winning shot. In truth my biggest point of stress wasn’t whether she would say yes or not, it was whether I would screw up the magic trick in my nervousness. It wasn’t a complex trick, but I still worried I’d screw it up, and obviously the effect was earth shattering. We kissed, hugged, and called family. Lots of phone calls. I called my dad, my siblings, my grandmom, and a few close friends. Then I tweeted the news and watched our phones blow up as we got well wishes and excited responses from our friends and family. After about 30 minutes of phone calls and sitting we gathered up and made our way back to the car. Once there I didn’t let Katie sit down yet, I got in and turned it on, put on the iPod and cranked it to play Stevie Wonder’s ‘For Once in my Life‘ to which we danced there next to the car in the parking lot. We held each other, laughed, got teary eyed, and swayed with the music. The song is only two and a half minutes long, but it’s such a great song. Once it ended, we kissed and got in the car to head to SAK. We went to SAK, told and retold this story, convinced people it wasn’t a prank (a side effect of comedy clubs, people are wary of practical jokes) and we hugged a lot of friends who were excited for us. We watched part of the show but by this time we were both beginning to wind down and feel the exhaustion setting in. No we do not have a date set. It will be sometime in 2010, but we have no idea on anything more specific than that. Please don’t start asking us about kids. We took nearly three years to get to this step. We won’t be rushed, we’re going to do it on our own time. No I won’t explain the magic trick to you. Yes I am available for consulting on your proposal planning. Yesterday was our long, awesome, amazing, magical, stressful, wonderful, unbelievable, dreamlike, everything-I-could-hope-for day. That is so sweet!! Great job, man, and congratulations again! Awesome story – thanks for sharing! Congrats, enjoy every minute! Great job buddy. Well executed. I actually got the Q <3 before the explanation. Good job Patrick. I’m thrilled for both of you. But seriously, how’d you do the magic trick? I am so happy for you both! This has been something everyone has anticipated. Katie you are so awesome and fit with Pat so well. You will most definitely make a very nice addition to the family. Congratulations!!! Well sweetie I am thrilled for you both. Sounds like you had such fun planning your surprise.